Ok, so are you ready for a break from Dopey related posts yet??! I didn’t write any sort of “2014 Goals” post around the New Year because I just felt like my focus was on completing the Dopey Challenge at the time and I didn’t want to look past that to the rest of the year quite yet. So, now that Dopey’s over I’ve had some time to start thinking about my running plan and goals for 2014. Speedwork – I prefer to make “speedwork” the goal rather than “PR” since it’s the speedwork that will actually get me there. I had started to do some speedwork when I had access to a gym and a treadmill for a few months and I really enjoyed it. I’m really not good about doing speedwork outside so I’m considering joining an inexpensive gym just for access to a treadmill again. Ultimately my goal here is to PR both my half marathon (1:59:05) and marathon (4:35:00) times. 5k & 10k – this may sound silly, but I have yet to run a “real” 5k or 10k for time! The only 5 & 10k’s I have done are at Disney and the 5k’s are generally un-timed “fun runs” and for both 10k’s I’ve been in costume (so not exactly running for time). I’d like to at some point do a non-Disney 5k & 10k just to see where I am on time. Clearly not running for time, but we may have PR’d in amount of sweat! I like every race I register for to have a reason rather than doing races “just because”. Races will typically fall into 2 categories – “PR Attempt” or “To-Do List”. 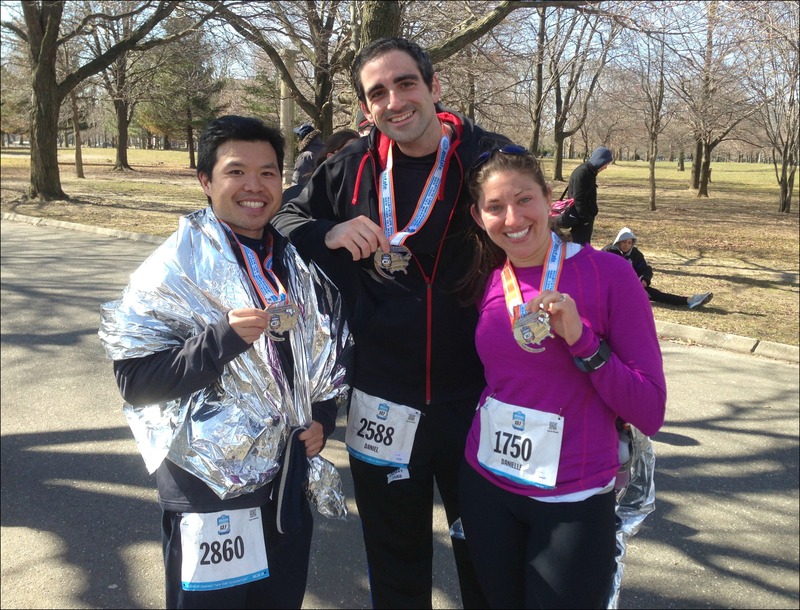 This is a half marathon in Queens that I’ve done the past 2 years (2012 & 2013). To be honest it’s not a great race or a great course but it’s local and I PR’d it both times I’ve run it in the past so I’m hoping I can keep up the streak and have myself a new half marathon PR this spring! I’ve heard great things about this race so I entered the lottery this year on a whim and got in! I loved running in DC during the Marine Corps Marathon so I’m really looking forward to this race, especially because I’ll be running it with two of my running partners in crime Patrick & Daniel (both pictured above!). So this isn’t technically a race “to do” since I did the Dumbo Double Dare last year, but more of an experience to do since Jason is going to be doing this race with me! Yes, Jason is registered for his first half marathon and I am SO excited! After joining me for the Disneyland 10k last year he immediately said he wanted to do a half and since Disneyland is the only runDisney event he can make with his schedule we’re off to California again! 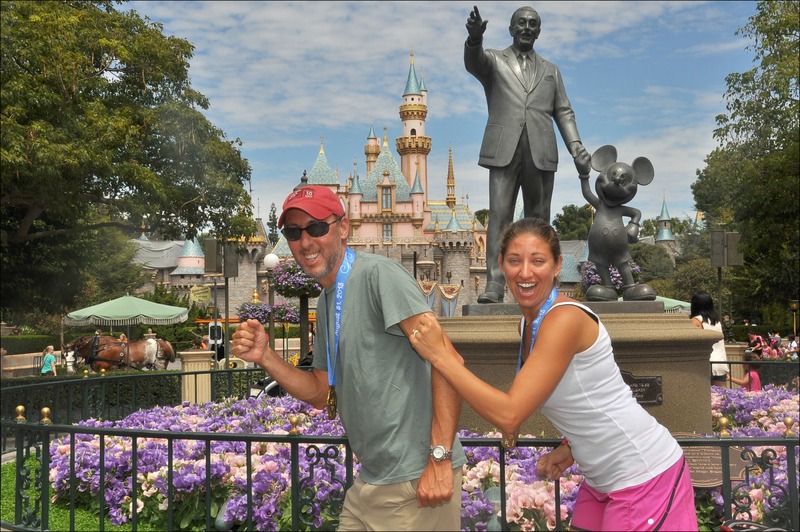 Jason and I “running” at Disneyland after his first 10k last year! My official “guaranteed entry” for the New York City Marathon isn’t until next year, but I am really considering joining a charity team and fundraising to do it in 2014 since I have so many friends that are running it this year! So this one doesn’t fall into either of the “PR Attempt” or “To-Do List” categories, but I definitely have a soft spot for this race since it’s where it all began for me. Back in 2011 this was the first race I ever did and I’ve done it every year since so I’ll definitely consider it for 2014 again! What races are you doing in 2014? Any suggestions for a spring marathon? Too funny — this is EXACTLY what I’m doing now! Todd and I have been planning our entire 2014 race calendar…and now that I have one full marathon under my belt, I’m itching to do another one — and actually run it for time. I haven’t been able to think about anything other than Dopey for months, so it’s fun to start planning ahead now! We’re running the Rock N’ Roll USA Marathon in DC in March — we’ve heard great things about it, and we’ve done a bunch of the RnR halfs and found them well organized and a lot of fun. As far as the NJ Marathon, I ran the half last year, which starts right before the full and runs the first part of the course. It was fairly flat and definitely a fun race; they changed the course quite a bit thanks to Hurricane Sandy, though, so it wasn’t as much “beach” running as I would have liked. I wanted to run the full this year but we can’t make the date…I’d definitely recommend it, though! That is AWESOME that Jason wants to run a half, now! So exciting! What’s funny is that I wasn’t planning on going back to DL this year, since I already did the DDD…but Todd is dying to see it, so it looks like we’ll see you there in August! I put in for NYC Marathon, too. Hoping to get in, but if not, I’d definitely consider going the charity route, too. Good luck! I’d LOVE to do Wine & Dine again, but we might make another RnR event our fall marathon: the one in Vegas. That HAS to be a good time, right? 🙂 I feel about the Princess Half the way you do about W&D…I’ll be back for Princess next month, and more than likely, next year, too…haha. I’ve never done one of the Rock n’Roll races but I was actually looking at Nashville, I’d love to do that or New Orleans one day. And good to hear you recommend the New Jersey race, it’s definitely on my radar unless I find something closer. And yes, I’m really excited about Jason doing his first half! I think it’ll be a lot of fun! Hope to see you in Disneyland! I’ve heard some mixed thoughts on the Cherry Blossom, mainly that it’s incredibly crowded but I will be volunteering at the finish line this year! You know you want to run the NYC marathon, so just do it. DO IT. Yeah, I’ve heard it’s crowded too, but I figure it’s a good race to do at least once! Fingers crossed the cherry blossoms are actually blossomed! I’ll be on blossom watch again, so stay tuned! Hey Danielle! I had seen the race for March 22. Is it hard to get to? I had been thinking about doing it, but I think it will be more complicated because it is not considered local for me. Heartbreak Hill Half in Boston (June 6-7) Kimberly and Gail are also running it. Dumbo Double Dare, ToT and Wine & Dine! The NYC 13.1 is not hard to get to at all, it’s right near Citi Field if you know where that is and there’s plenty of parking. Just a fair warning like I said, it’s really nothing special, I’m only doing it again because it seems to be a bit of a lucky race for me (knock on wood!). And I was looking into the Heartbreak Hill Races too. I’m going to take a look at the Providence marathon now and see how that looks compared to the New Jersey one – thanks! 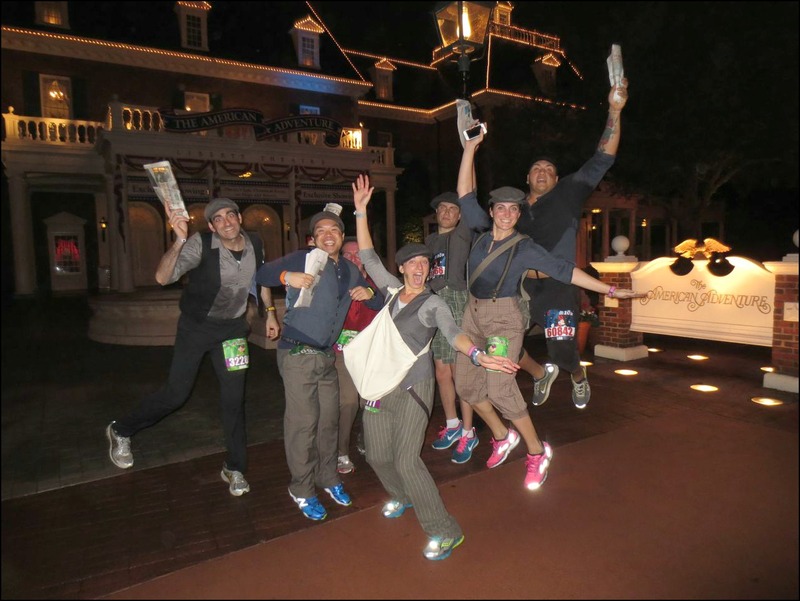 Oh and I LOVE the picture of you guys all sweaty in your Newsies costumes!!! P.S. – just checked out the Providence Marathon…thinking that may look better than New Jersey! Yes the course is nice and flat! And there will be 3 of is there already! Hi Alex! The Wine & Dine Half Marathon is a great event and you’ll be fine with the extra 3.1 miles! Honestly the hardest part of W&D is that it’s at 10pm! As long as you rest and plan your eating accordingly it’s totally fine though and the after party is a lot of fun! Good luck and let me know if you end up registering for it! I’m doing the NYC 13.1 too! I’ll probably be crossing the finish line as you get back to your house lol. But NYRR also has a 10K in Queens along a similar course…downside is it’s in June/July and, well, you know what the weather is like here around then (plus no medal! Disney has me spoiled! lol). And it’s so funny that Doug had the same reaction that Jason did, after running the 10K he wanted to do the half (it was too late to sign him up for the Princess, so we figured his family could watch him cross the finish line at the Brooklyn half). I’m definitely not doing the NYC marathon, but I think I’m going to volunteer for it since I know so many people running in it! Sorry, that was a really long comment! …and a lot of exclamation points. Oh good, I’m glad to hear you’re doing the NYC 13.1 too, we’ll have to plan to meet up before it! Honestly, it’s a good PR race mostly because it’s boring as heck so all you want to do is run and get it over with! And yeah, I try to avoid June/ July/ August races, just to darn hot! It’s weird not having anything planned right now, and when my therapist asked what race was up next, I almost felt like maybe I should have a race lined up, but I’m OK with taking a break right now. I want to get healthy so I can tackle more races. Yes, definitely get better before adding anything to your plate! To be honest I was planning on a bit more of a break after Dopey but I’m pretty excited about trying for a full PR after my time at the marathon! I’ve got Wine and Dine on my To-Do list, hopefully this year. I mean, Wine! And Dine! It’s really a fun race, that’s why it’s so hard for me to pass it up every year! Really can’t beleve youv’e got Jason running. Good for you and him. Nice you’ll do something you like doing and have J doing it as well. Hope he can keep up. I won’t leave him behind either way! Greater then great reply. Your so great for him. He’s very lucky to have you in his life. U make him very happy and that makes me happy! Very cool! I also didn’t look past the Dopey. Pretty soon I’m going to make a 2014 plan of attack. Like you, I want to focus on speed. I’d really like to run a 1:45 half as a next goal (down from 1:47:43). I’d like to do the Dumbo, but need to save up some skrilla first! These races are getting pricey! The Big D Marathon is in the spring here in Dallas if you want to come! Haha yeah, for running not being an expensive sport it sure does cost a lot! Hoping to keep the spring full marathon somewhat local to save some money! I LOVE that Jason is doing a half-marathon with you! Fun! Looks like you’ve got a great running season lined up. I’m still sorting out my running calendar. So many races so little time! Haha, I know, there are so many I want to do! And I’m really excited about training for and running a half marathon with Jason, I think it’s going to be a lot of fun! Great list of races! Can’t wait to hear about your March half – you are going to rock i!! I’ve put my name in the NYC lottery, and honestly I don’t know if I want to do it this year…well over $300 for Canadians! Planning out races is fun!! How cool that Jason is going to do a half with you! I’ll be at Dumbo as well so hopefully we’ll run into each other! Besides Dumbo, I’ve got NYC Half which I’m nervous about and the Soldier Field 10 Mile in May. Oh and Princess this next week! « Dopey Challenge: Meeting Some Friends Along the Way!